When your equipment isn't working, you need a technician who can get it working again, without unnecessary hassle or expense. Someone who can pinpoint the problem. Someone who brings the right parts the first time and solves the problem quickly and efficiently. 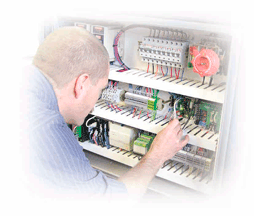 Technical Packaging Systems employs technicians who have the experience to solve your problem. Our technicians' training is best-in-class, including PLC programming, on-going factory training, and equipment rebuilding. We maintain an inventory adequate to cover all common service problems. For uncommon problems, we will quickly obtain the part necessary for the job to get your operation running again. We can design a program for your equipment, based on your usage, that will optimally replace wear parts and manage cycle time rebuilds or replacements. TPS service technicians will regularly inspect machinery and recommend parts, if any, to be replaced. This will insure maximum uptime on your packaging machinery to keep you operational. Even good machinery requires the adjustments to make it run efficiently. We assess all the factors that impact your unit cost—cycle times, film weight per load, among others—and adjust them to obtain the lowest per-unit cost attainable. Technical Packaging Systems works with you to get the job done as efficiently as possible.